Here's an example of how to build a module and add a basic panel option to the file menu in Synfig Studio. For this example I will make a empty panel option and have subsequent parts adding to it. **	the License, or (at your option) any later version. **	General Public License for more details. 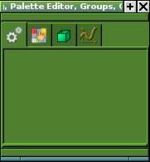 This will be added above the PALETTE_HH section. This will be added to the list of items in the "synfigstudio_SOURCES =" line. Note: This directory structures is based on the *NIX environment. After you install the newly compiled Synfigstudio, run the binary. 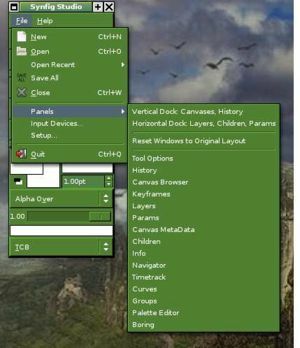 From the main Synfigstudio interface choose the "File" option and select "panels". From here your new panel should be located in this list of items. Select it. An empty tab window, based on the default synfigstudio layout should show up with the default exec icon. The only thing you can do at this time is drag and drop it into another one of the panels. 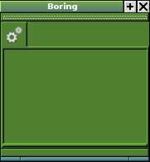 To try this choose one or more and drag it onto the boring panel. They should become one. This gives you a basic dock widget to work with. This will be described in the next part of adding a panel. This page was last modified on 16 March 2017, at 12:09.